Sabres captain Jack Eichel tries to get the puck from Leafs star John Tavares during the teams’ meeting in Buffalo on Dec. 4 (Harry Scull Jr./Buffalo News). The Buffalo Sabres have a chance to get rid of a pair of illnesses Wednesday night in KeyBank Center. They're sick of losing to the Toronto Maple Leafs. And they're sick of not being able to win two games in a row for more than three months. A pair of ugly streaks are at play here when the teams meet in what figures to be yet another quasi Leafs home game, with the building full of their fans. "The games here against the Leafs are a lot of fun to play in," Sabres winger Kyle Okposo said after practice Tuesday. "A lot of people from Toronto come down and I know we haven't beaten these guys in a while so I'm really looking forward to a great test." Indeed, the Sabres have found no success against the Leafs in recent games. They're 0-2-1 this season and in danger of going winless in a season series against Toronto for the first time since 1987. And their current four-game losing streak against Toronto (0-3-1) is their longest since a five-gamer in 1972. There's more. The Sabres are 19-4-2 in their last 25 home games against Toronto but have lost two straight. And get this: The Leafs have not won three in a row in Buffalo since winning the first six meetings in Memorial Auditorium during the first two seasons after the Sabres entered the NHL in 1970. 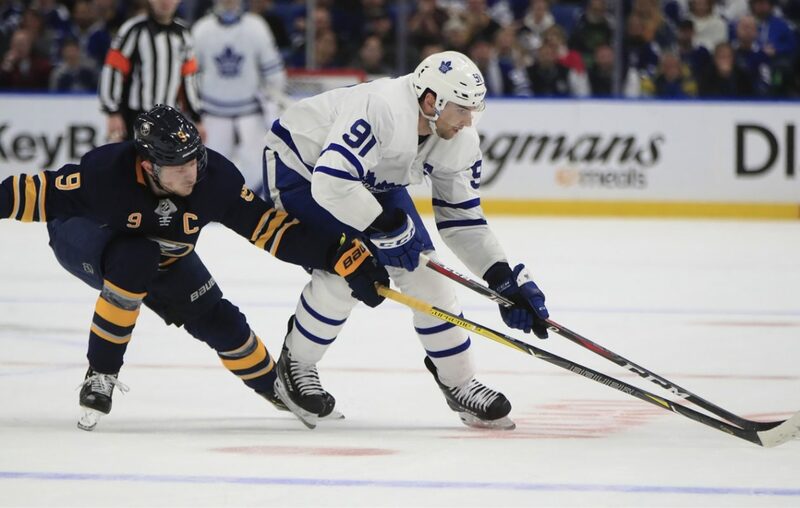 The Sabres suffered a 5-4 overtime loss to the Leafs here on Dec. 4, falling on an Auston Matthews' goal inside the final three seconds of the extra period. They endured 5-3 and 5-2 losses in Scotiabank Arena within the last three weeks, giving up goals in bunches in both games. "The first game we played against them here I thought we played a really strong game," coach Phil Housley said. "It was an up-and-down game and we were aggressive, we were on the forecheck. The last two games we played, it was just a couple little mental lapses, two- and three-minute spans." "It's definitely not a good feeling," added center Evan Rodrigues. "You don't like to lose to anyone, but especially those guys. We have a chance tomorrow to put that behind us, get a win and keep moving forward." The Sabres are coming off Sunday's 4-3 shootout victory over St. Louis that snapped their seven-game losing streak. Thus, this is yet another chance to forge a winning streak, something Buffalo hasn't done since mid-December. Incredibly, the Sabres are 0-10-1 in their last 11 attempts to string two wins together. They've gone 40 games without a winning streak, just shy of the franchise record of 44 set in 1971-72. "That's just a stat that boggles my mind," Okposo said. "It's a tough one to hang your hat on. We want to finish strong here and this is a huge game." "You can't really complain. We just haven't done it," Rodrigues said. "It's something you don't want to have be a thing but it is, so we have a chance to get rid of that." When the Sabres hosted the Leafs in December, they were coming off a back-to-back the previous night in Nashville. So they were adding in travel and a time zone change. The Leafs will be following the same itinerary in this meeting, coming from Tuesday night's game with the Predators in Bridgestone Arena to the showdown in Buffalo. "We had a hard game in Nashville the night before. ... It was a shame we came out on the losing end of it," Okposo said of the first matchup. "The two games up there haven't been great so we want to make sure we come out and have a great effort and get a win for our fans. "You always want to jump on a team playing a back-to-back, especially with travel. I don't know what it is but it seems a lot of teams have come out flying, especially if they played the night before. Maybe later in the game you wear them down. We'll have to be ready."